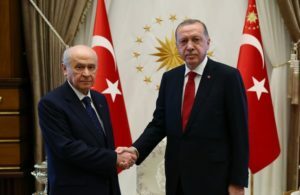 President Tayyip Erdogan and Nationalist Movement Party (MHP) leader Devlet Bahceli, his ally in the opposition, agreed Wednesday to lift the state of emergency in place since July 2016 following the failed military coup. Erdogan met with Bahceli after his victory in the Sunday presidential and legislative elections, local media Sabah reports, noting that the two leaders agreed “not to extend the state of emergency”. The security measure extended three months ago will end next month. The MHP is the alliance partner in the government of Erdogan’s Justice and Development Party (AK Party). Both parties won majority in the Turkish parliament, 53.7 per cent, according to figure posted by the pro-government media. Few days before the election, Erdogan stated in an interview that lifting the state of emergency will be his first decision if he wins the elections. The Turkish leader imposed the state of emergency after a military coup attempted to depose him. The move failed in a matter of few hours. Critics and the opposition criticized the decision that they viewed as a tactic by Ankara to crackdown on dissent. The clampdown has been directed at military officers, civil servants, university lecturers believed to have links with the coup allegedly masterminded by US-based cleric Fethullah Gulen. More than 50,000 people have been jailed and 150,000 sacked or suspended from their jobs. Written by: KanelkaTagba on June 28, 2018. Posted by KanelkaTagba on Jun 28 2018. Filed under Headlines, World News. You can follow any responses to this entry through the RSS 2.0. Both comments and pings are currently closed.